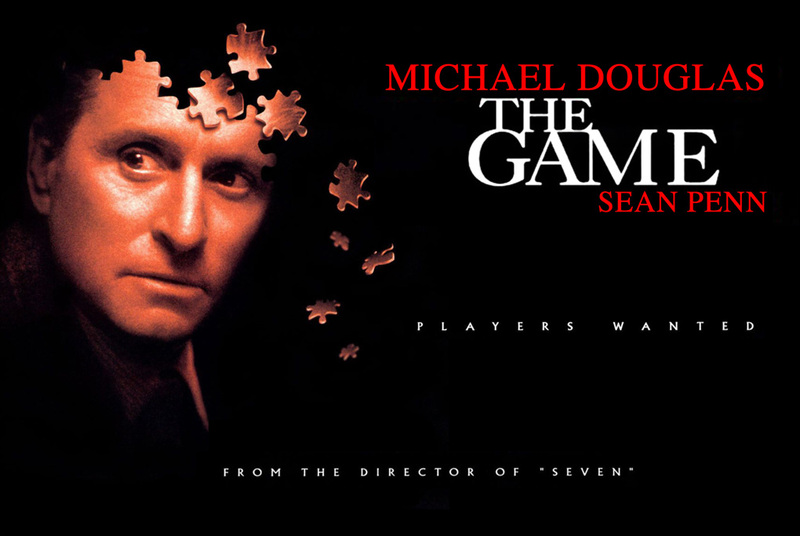 The Game is one of those films that’s received more credibility over the years as history has caught up to central premise, which is not that bankers are supercilious dickheads drunk on Ayn Randian Kool-Aid who couldn’t last five minutes in a genuinely competitive environment (even if that might be true and a building block of the films premise) rather its about the modern-day feeling we all share that an unseen corporation is controlling our life, for reasons we can’t understanding driven by motives we can’t identify. This crucial point, and the one that rescues the film from being just another one of those moralistic-right-leaning “see I can pick on bankers too” films about “greed” is highlighted in the last moments of the film that occur after the great twist (no spoilers, I promise) when the palpable discomfort continues, despite the climactic resolution. Written by John Brancato and Michael Ferris hot on the heels of that other prophetic film The Net, just as with Se7en, Fincher spots a script with huge potential for mise-en-scène and successfully integrates the two key components of his films; it will become a running theme for Fincher – when the script works and is something he can connect with, you have a brilliant film and when it doesn’t you get a dud no matter how beautiful. A great script tends to keep his adman at bay also. The Game falls more into his art film category, which I would define as not adhering to a time-bound sexiness that consequently dates the film. One of the central complaints by critics at the time is the ludicrous ending (and it is so insane The Simpsons devoted an entire episode to it, even going as far to mock Fincher’s influences, and include Edward Norton the star of one of the most beloved Fincher films) which adheres to tropes of heist films but does feel tacked on nonetheless, but it’s the way Fincher keeps the cameras rolling that give the ending its real punch and this was probably difficult to see at the time. It is possible Fincher didn’t see it himself, as I can’t find an interview with him around that period that confirms my interpretation (but it was 1997, and we were sort of “net-less” by today’s standards) but he had the wit and project engagement to allow a certain sort of creative flow that tapped into something his anxiety mise-en-scène captures perfectly. Few people who’ve seen The Game will forget the scene when Nicholas arrives home to find he’s been burgled, and he slowly walks through his fluro graffiti covered house to Jefferson Airplane’s White Rabbit. The above scene perfectly encapsulates the way Fincher is able to use design, cinematophgraphic as well as directorial, to evoke mood. Nicholas Van Orton trails the mood imposed by Fincher, something Fincher was able to do in Se7en – another film where an outside force controlled events. 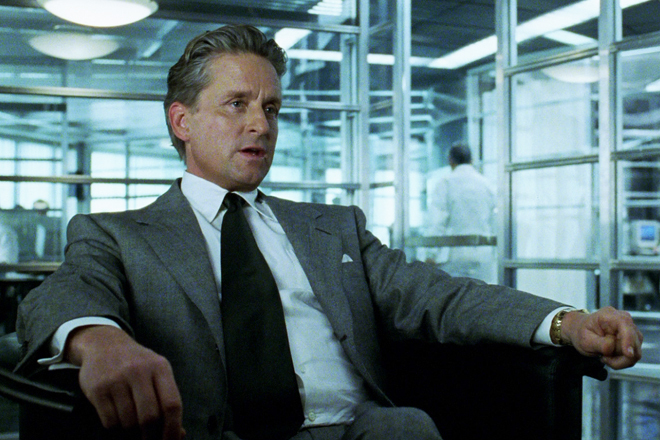 However, the key to The Game is in the interplay between Fincher and Douglass, who is better here than I remember him ever being anywhere, the ten years on from Gordon Gekko thing being an added bonus. Fincher embodies CRS, so that the corporation (much like the faceless companies Van Orton uses to control people’s lives in his job) is a very real disembodied presence. For the “Masters of the Universe” there is only one power they bow to, and that is the rights and the might of the corporation – in fact their relationship to the corporation as an entity is identical to our relationship to the “banker” himself. We fear those “Masters of the Universe” but make no mistake, we allow them to exist because we want to be one of them. The only entity above the capitalist Übermensch is the corporation itself, and all of this narrative structure is imposed on The Game by Fincher’s directorial style over and above the wit and precision of the script. These transgressive realisations are crucial to that style depth I argued Fincher withdrew from in Se7en and the difference in the two films is revealed in their longevity. Se7en is deeply loved, make no mistake about it, but it doesn’t have the philosophical depth Fincher achieves in The Game, the moral ambiguity nor the reflective questioning. The script plays it safe in The Game, Fincher doesn’t. And it is likely that this was a point of struggle for him – that inner civil war I articulated where the adman meets the creative. Much of this struggle is revealed in the original trailer. Fincher’s original trailer is one of a puppet held by an unseen master who is tugging him by the strings. There is only one scene from the film used, and that is where Nicholas bursts through the ocean surface grasping for breath. This trailer was abandoned for a more mainstream version and at Polygrams insistence the image of Douglass with the puzzle pieces in his head was brought to the fore, the marionette all but forgotten. The marionette is definitely the arthouse approach to The Game and although trailer that would encourage the likes of me to see the film, I doubt Fincher’s inner adman would have approved. Polygram got their way (as far as I can tell) without much fuss from the sympathetic Fincher, but the difference stands as testimony to an inner crises Fincher deals with at the edge of each film he decides to make. For someone watching all his films in sequence, and reading everything I can get my hands on about him, it comes as no surprise that the more and more experienced director is trying to let an intuitive connection with the human experience take over his “corporate creativity”, revealed in the sequencing; it makes perfect sense that The Game follows Se7en and Fight Club, definitely Fincher’s most art house contribution, follows The Game. However, in terms of a film that only garnered an average sort of success (it doubled its packet at the box office which is considered a success by today’s standards) that probably rode more on the heels of Se7en (that was a huge commercial success) than it’s own appeal, but represents a period in the directors career where he must have been noticing giving people what they want pays better than giving people what they need.